I have not meant to ignore my blog lessons, but I have to admit that I have been side-tracked by a long-running project. By long-running, I mean since 2001!!! I started this quilt back then, and have worked on it off and on for many years. Recently, seeing how close I was to completing it, I picked it up and worked hard to complete it. 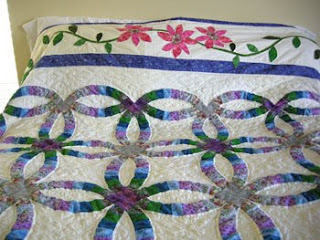 This quilt is a Double Wedding Ring quilt, completely hand pieced, hand appliqued, and hand-top-quilted. I can't begin to tell you how many hours have been poured into it! I completed it recently, and thought I would share the photos. So, I do more than just paint with watercolor. 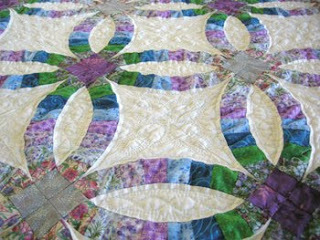 When I am quilting it is hard to put it down, so the painting gets set aside for a short time. I continue to teach, so I am still painting nearly every day, but when I have a quilt project, well...the evenings get away from me. I will try to post another watercolor lesson soon! The quilt is beautiful. I can guess how many hours went into. Hundreds, maybe thousands of hours. 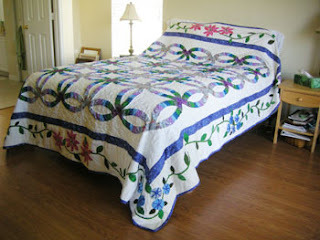 I have hand pieced, appliqued and hand quilted quilts so I know a lot of time went into this. I really like the purple blue green fabric combination. Congratulations on getting it finished.